Sabrina and Scott McGillivray know a thing or two about beautiful homes. Not only is Scott a real estate and remodeling expert on HGTV, but he and Sabrina are also both equally passionate about design and inspiring others to achieve their goals for home ownership. The couple recently chronicled their own dream home pursuit as part of the HGTV Canada series, Moving the McGillivrays. 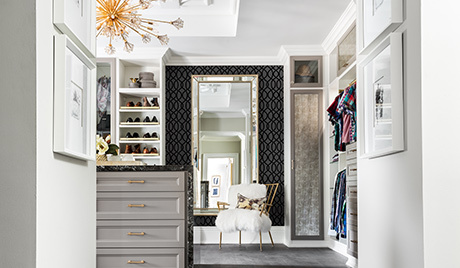 When it came time to create the dramatic and functional dressing room they had always wanted, the couple turned to California Closets Toronto to create a custom organizational solution that addressed their specific needs and personal style. 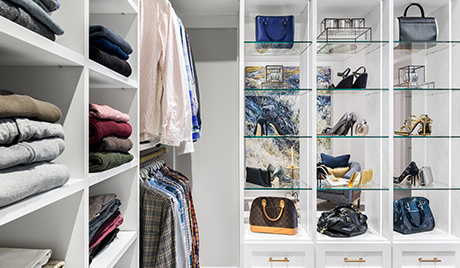 Beyond optimized storage, the couple also desired thoughtful space for showcasing special items, seating options and improved visibility for accessing and appreciating their wardrobes. Working with California Closets design consultant Cassandra Reinthaler, the couple carefully considered every detail of their space. Taking their unique objectives into account, Cassandra incorporated varying materials and bold accents to add depth, richness and interest throughout. The design featured distinct areas to support a variety of the couple's activities, while a stunning center island created a common focal point. To seamlessly integrate the couple’s select statement pieces, such as Sabrina’s gold vanity, a bench was built on either side of the vanity that doubled as both inviting seating for the couple's daughters and extra storage. 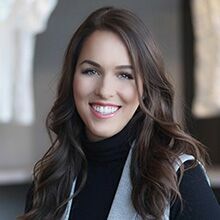 Cassandra also addressed Scott’s storage needs with custom cabinetry around the windows, as well as Sabrina’s love for accessories with a dedicated wall where she could beautifully display her collections of shoes, bags, scarves and jewelry. Finally, accent lighting was strategically incorporated to offer visual impact and illuminate the couple’s statement display areas. this luxurious retreat maintains a warm and sophisticated style that the McGillivrays can call their own.